Xcaret received the "Liseberg Applause Award" at the Expo Attractions of IAAPA, the largest international fair in the entertainment industry. 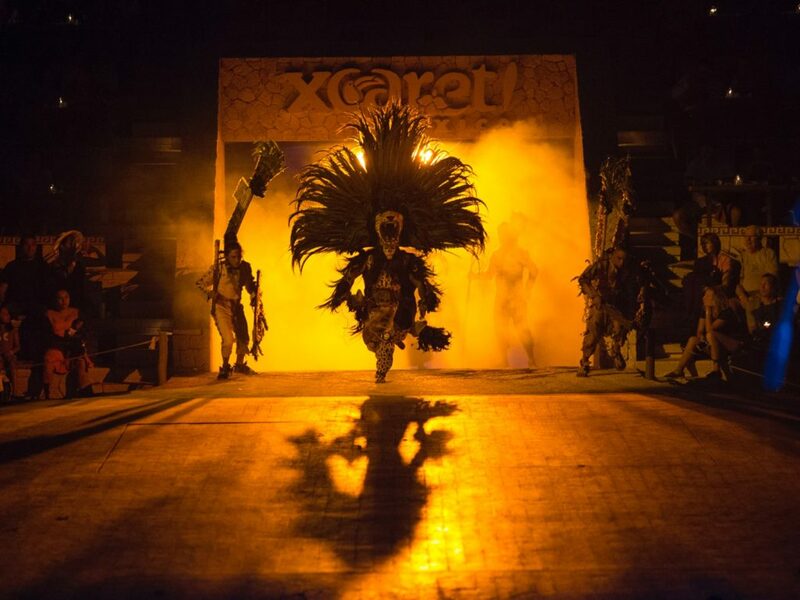 "With an original and creative vision, Xcaret has developed one of the most authentic and unique destinations in the world," Andreas Andersen, president and CEO of the Liseberg Group. "This is a great distinction that we share with Mexico,"Miguel Quintana Pali. ORLANDO, FLORIDA; NOVEMBER 13, 2018.- Within the framework of the Expo Attractions of the IAAPA, the largest international fair of the entertainment industry, Xcaret Park, of Cancun and the Riviera Maya, received this morning the “Liseberg Applause Award”, which is presented every two years to the attractions park whose management, operations and creative achievements have inspired the industry with its foresight, originality and solid commercial development. “With an original and creative vision, Xcaret has developed one of the most authentic and unique park destinations in the world. The park balances world-class experiences, based on native culture and natural attractions, with sustainable operations and a strong commitment to the local community,” said Andreas Veilstrup Andersen, president and CEO of Liseberg Group and chairman of the Board of Governors of the Applause Award. In the entertainment industry the “Applause Award” is considered the “Oscar” of the parks in the world. It is an international prize awarded by Liseberg, a world-famous theme park in Gothenburg, Sweden, that based on an assessment of the best parks in the world, recognizes the highlights based on the opinions of industry representatives, adhered to the IAAPA. Other finalists were PortAventura World from Spain, and Universal Studios in Japan. Upon receiving this recognition, the President of Grupo Experiencias Xcaret, Miguel Quintana Pali, assured that it is a distinction that the flagship park of that business group has been recognized by the entertainment industry. He said that he is proud of it, because Xcaret has always been a park that promotes the nature and culture of Mexico, and shares this achievement with its partners, co-workers, its family, and with Mexico. Among the criteria that are evaluated is the projection shown in the ability to forecast and plan future trends, together with a record of success in the introduction of new attractions, shows, accommodations, or marketing activities in target marketplaces. Originality in landscaping is also qualified, as well as creativity in the design and selection of attractions, shows and accommodations. Another criterion is the development of businesses with good management practices and human resources, marketing and brand position in the market, operating systems, profitability and long-term growth, as well as a sustainable pattern of repeat visitors over several years. Recovered the Pre-Hispanic Ball Game, a grand tradition that had fallen into disuse. Nowadays, it is not only played in Xcaret, but in many Mayan communities of the Yucatan Peninsula and Central America. Signed a historic agreement with INAH that allowed the restoration of the archaeological zone of Xcaret, and consolidated research on this important site of the Mayan culture. Recovered the Sacred Mayan Journey, a pre-Hispanic tradition that stopped being practiced for more than 500 years, and today is a pride of Quintana Roo and its inhabitants. Designed and staged the most representative show of Mexico in the world, with more than 19 million spectators. Created the first living coral aquarium in the world, developed by Mexican specialists. With significant advances in the investigation of marine life, it has achieved the reproduction of coral species in danger of extinction and has opened the possibility of recovering reef ecosystems. Increased the population of the scarlet macaw in the wild jungles of Mexico by 97%, an extraordinary achievement as it is an endangered species. Promoted Mexico’s most important conservation program for sea turtles, helping more than 13 million hatchlings to reach the sea. Became the first private company in Quintana Roo to offer an environmental education program to public school students. Day of the Dead was revived with all its traditions and inaugurated the regional pantheon of the Yucatan Peninsula more than 13 years ago. Enabled three subterranean rivers so that visitors could get to know the wonderful underground that characterizes this region of the country. Became constituted as the primary Embassy of Mexico to the world. It is the principal promoter of the flora, fauna and culture of the southeast region of Mexico. It laid the foundations of sustainable tourism recreation in Mexico, with the Ulysses recognition of the World Tourism Organization. Thursday, November 15, 2018 In Press Releases, Press Room.